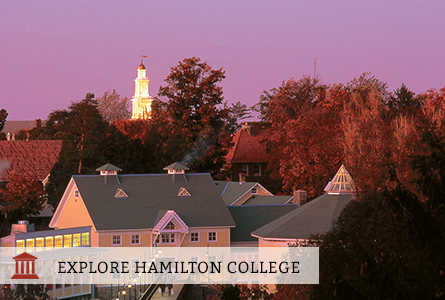 Hamilton is one of the few U.S. colleges with an open curriculum, which means you’ll have the freedom to choose courses that reflect your interests, while still fulfilling the faculty’s expectation that you study broadly across the liberal arts. Students choose from 56 areas of study and 43 majors, with special advising for medicine, law, business, engineering and education. The student-to-faculty ratio is 9-to-1, and 75% of classes have 19 or fewer students. Sixty-five percent of students spend at least one semester studying abroad or off campus. Through independent projects, the Senior Program, and summer internships with faculty members, Hamilton provides an increasing number of opportunities for students to engage in significant research at the undergraduate level. The College has highly regarded academic centers for writing, speaking and public policy. Ninety percent of seniors had one or more writing center conference during their four years, and the Oral Communication Center had more than 650 consultations last year.